The following are a few events and occasions for which people commonly hire our displays. Not sure what to hire for your special occasion or party – contact us and we can help plan an imaginative display to suit your needs! Quotes are free! Don’t know what to buy that special person for their birthday who has everything? Flamingos for Celebrations are here to help with displays for party hire! Whether celebrating a 1st or 100th birthday, we can make it an unforgettable special occasion. Children and adults alike all love our large display characters, which include dinosaurs, teddy bears, kangaroos and elephants to name but a few! Anniversaries are occasions which should always be celebrated! Surprise your loved one or that special couple, who have been together forever, with a lawn ornament display that is sent with love. Why not ensure the decorations for your wedding ceremony or vow renewal event are truly memorable with our popular flamingo display? Missed someone terribly and would like to give them an extra special welcome home? Whether your loved one has been away studying or travelling, working or living overseas, or perhaps been away on a mine site or oil rig, then Flamingos for Celebrations can help. Our gorgeous hearts and bears are the perfect welcome home event display to book! Part of a school prom or graduation ball committee looking for ideas to make the event extra special? 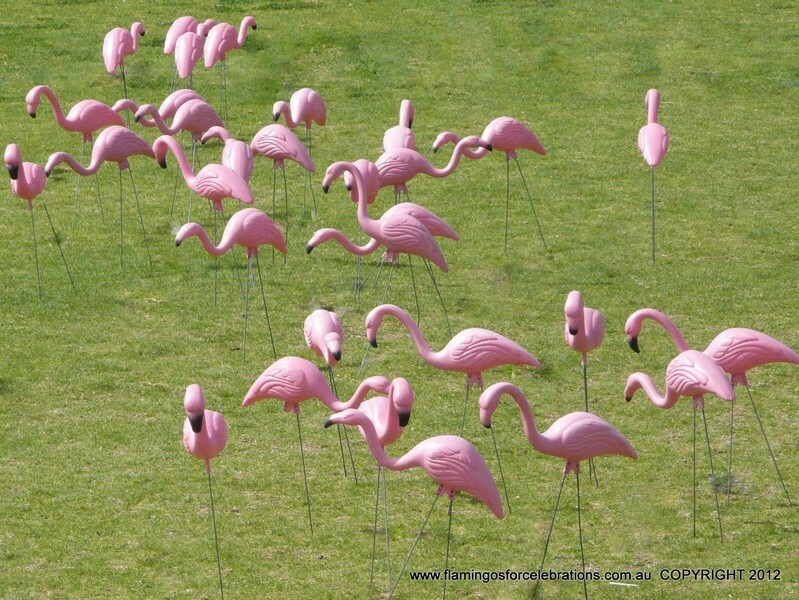 Flamingos for Celebrations of Perth can help with decor that really stands out and is sure to be remembered! Why not go for a retro tropical theme and hire our popular flamingos? If you need to impress, or you just want to make that next Perth corporate function or themed party special, contact us and we will help you to make it memorable. Be it a general event, party or a special occasion such as Australia Day, we have a whole host of decorations to suit your theme.